Inspiring people to change their lives and succeed. Best-selling author Bryan Falchuk is available to speak at your next meeting, event or other setting where a group of people could benefit from learning the inspiring message of Do a Day. Bryan speaks on motivation, culture, success & more. 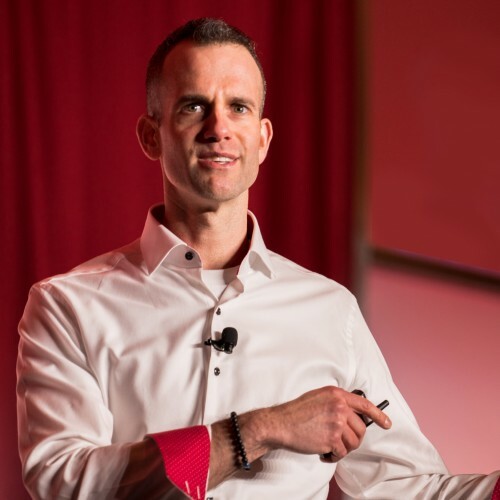 Bryan Falchuk is a TEDx speaker, best-selling author, executive and life coach, public speaker and Certified Personal Trainer and Behavior Change Specialist. He works to help people change their lives for the better. Bryan spent 20 years in the insurance industry where he was most recently a C-level executive at a public company. He has also been a management consultant at McKinsey & Company, and holds an MBA from the Tuck School of Business. He is a regular speaker at various events on the subject of motivation, culture, interpersonal dysfunction and overcoming challenges. As an insurance executive, he was also regularly a keynote speaker, event chair, panelist and moderator at conferences in that industry. Bryan's best-selling first book, Do a Day, teaches the philosophy Bryan developed to find your true motivation, set meaningful goals and achieve them by freeing yourself of judgment of the past and fear of the future. He has used this approach himself, and successfully coached and mentored others using Do a Day. Bryan has been interviewed on over 100 podcasts and radio shows to share his story and philosophy, has written over 35 articles for Inc. Magazine, and has had articles featured in the LA Times, Chicago Tribune, Baltimore Sun and other major newspapers. Bryan has also been a presenter at multiple TEDx events. He is currently working on his second book, The 50 75 100 Solution, which teaches a way to solve relationship dysfunction and create positive interactions. Learn more about Bryan and Do a Day by downloading the media kit at bryanfalchuk.com/mediakit. You can also view two of Bryan's TEDx Talks by visiting bryanfalchuk.com/tedx. Find out more about Mr. Bryan Falchuk at http://www.bryanfalchuk.com.